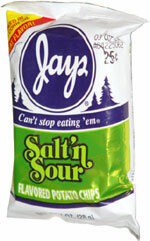 Taste test: These taste like salt and vinegar chips, despite not having any vinegar in the ingredients. Good crunch, not too greasy. With the lick test, it's a very strong taste. Smell test: Pretty good vinegar smell.